You know how the flu virus can get you down? You feel under the weather, and just don't function the way you normally do. Well, computers can get viruses as well, which cause them not to operate properly. At the very least computer viruses can be an annoying blip in your day; at their worst, they can wreak complete havoc on your system and cause you to lose files or render your hard drive inoperable. Computer viruses can cause both individuals and businesses to lose days of productivity, potentially costing valuable time and money. So, how do computers get viruses, and how can you avoid them? ABC News. Saturday, 20 Apr 2019 14:17:11 -0400. BBC News. Thursday, 04 Apr 2019 12:50:44 GMT. Let's define viruses first. Viruses are nasty programs that infiltrate your computer either through the Internet or through email, downloaded files, or even from store-bought software. In most cases viruses are attached to programs or files, allowing them to infect your computer, replicate themselves on your hard drive, and then damage your hard drive, data, or files. Frequently, viruses hide inside programs and don't do their damage until you run the programs. Once a virus gets inside your computer, it can do its damage quite methodically. As it goes from program to program, it places a flag called a "virus marker" inside infected programs. If a virus runs into one of these markers it knows not to replicate itself in that program and will continue to search for unmarked files. When it runs out of unmarked files to infect, the virus usually goes to work on the computer's data and hard drive. Once your computer has been infected with a virus, what kind of damage can it do? Well, that depends upon the virus. Some viruses ensure that programs don't work quite as they should, while others destroy the files on your computer, change the system files that your computer needs, or cause different kinds of damage. 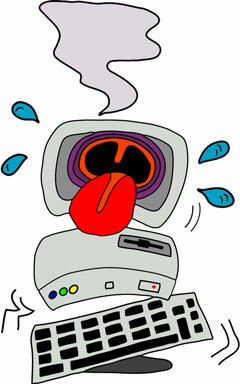 Viruses are usually written for a specific type of computer; in other words, a virus that is written for a PC won't infect a Macintosh, and vice versa. A Trojan Horse is a type of computer virus that appears helpful at first but is, in fact, a virus. The most famous Trojan Horse of all was sent via email as a Microsoft Word file; it destroyed many Internet and corporate mail servers. So now that you know what a virus is and the damage it can do, how do you protect your computer? The best course of defense is to install antivirus software on your computer. Depending upon your computer and your needs, there are several types of antivirus software on the market. Some of the more popular antivirus software vendors include Symantec, McAfee, and Kaspersky as well as Avast, AVG, and Panda Security. Antivirus software checks your computer for viruses every time it starts up, either by looking for virus markers or for other telltale signs like the changing of a file's size. Eradication programs are another type of antivirus software, but instead of detecting viruses they actually destroy them. With a bit of education and the right tools, you can be more confident that your computer stays virus-free!